There is a fine line between jealousy and envy. I had thought of them as pretty much the same thing until reading Stan Carey’s blog post on the subject. I think that admiration is also quite close; it is the nicer, more well-behaved cousin of envy. I have found myself admiring the work of some of my colleagues in other institutions, but also feeling jealous of their ability to make their work look easy and to bring off brilliant public engagement events. I have just filed my report about a stint of science busking that I organised last month, as part of our MRC Centenary celebrations. This was inspired by the Francis Crick Institute’s science busking programme last year, organised by Lex Mannion. Lex helped me a great deal in defining our initial busking proposal and giving me practical advice. a small-scale public outreach technique – a way to engage the public with science – that has become very popular in the last few years. It is science by stealth: fun, informal and entertaining. The aim of science busking is both to entertain and to engage people with science. I didn’t actually do any busking myself but I recruited volunteers from among our researchers, I organised the training, and on the day we did the busking for real I carried the props (and umbrella), and bought the coffees. The first success of the programme was the training, provided by Ken Farquhar. He showed us how to communicate, how to attract attention, and how to be persistent without being annoying. He also helped us to develop some busking routines that could link in to conversations about our science. The only problem is that Ken is so gifted at public performance and interacting with people that he makes you feel incredibly clumsy in comparison. However he has figured what it is that he does to make this all work for him, and he is good at passing on this skill to his trainees. Originally I had planned to have 20 teams of buskers working across four days in a big indoor shopping centre in north London, but bit by bit the plans were scaled back. First the shopping centre turned down our proposal, and then one by one my volunteers pulled out, leaving me with a much-reduced team. In truth, I think I should have been managing the volunteers more actively, reminding them and meeting up with them to keep it in their minds (and diaries). Eventually the day for our busking came. We had three teams, working in shifts, and in total they talked with about 50 people for between 2 minutes and 20 minutes each. It worked, though the day we had chosen was particularly windy and increasingly wet so we finished earlier than planned. But, 50 people is 50 people! It was quite a new departure for us as most previous outreach here has been targeted at schools, and largely at groups visiting the Institute rather than randomly targeting people out on the street. I felt very isolated, being the only voice trying to make this event happen in the midst of scepticism all around (“Science busking? What’s that? It’ll never work!”). But, we did it; the buskers enjoyed it; the victims audience enjoyed it. We put out the word on to the wild streets of North Finchley about science, the Institute and the MRC. The positive things I will carry forward are those memories of successful interactions – all the people who had their eyes opened, their curiosity tickled, their lives changed. We hope to do some more science busking later this year, ideally on a day without wind and rain, and possibly in collaboration with the Crick’s science buskers or another group we made contact with, the London Science buskers. Thus I was bruised but unbowed by my experience of organising outreach stuff. I am not sure if I want to do any more of it, but I enjoy seeing the results of other people’s efforts. 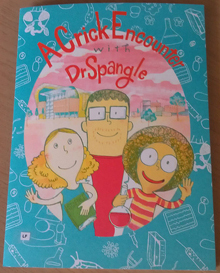 About the same time I was in thick of my science busking project I attended the launch of a series of three booklets aimed at children, published by the Francis Crick Institute. 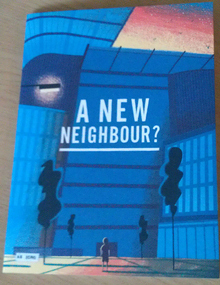 However this wasn’t just the launch of three booklets, but the culmination of a few months of work involving a range of different people working together to produce the books. The Science and Story project was organised by Lex Mannion, the Crick’s brilliant Education and Outreach Manager. I loved everything about this project. It linked up a children’s writer, three designer/illustrators, a handful of scientists, groups of children and community groups. The principal outputs were three illustrated children’s books, but the route to their production entailed running a series of workshops, which sounded like great fun for everyone involved, and there was also a 5 minute video about the whole process. 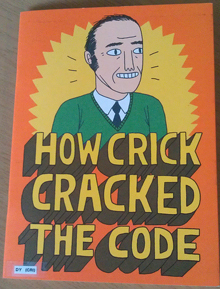 You can read more about the project on the Crick website, and I urge you to watch the video; it is charming. The three books covered Francis Crick and the structure of DNA; research about malaria and cancer; what the Francis Crick Institute is. What I love about the project is the mixture of different outputs, and the fact that there is a lasting result from it (i.e. the books). The children involved in the workshops are also featured in the books – either through pictures they drew of themselves or other artwork that they contributed. In the workshops the children interacted with the writer, designers and scientists. And of course the children are also the target audience for the books. I am reminded of another brilliant project conceived by another brilliant public engagement practitioner. Brona McVittie from the MRC Clinical Sciences Centre launched the Suffrage Science project a couple of years ago. Again it involves a range of activities and outputs, from fabrics, jewellery, books, and events, and it has a long-range effect as the Suffrage Science process continues year after year. I wish that one day I could dream up something like these projects, and see it realised. This entry was posted in Communicating science. Bookmark the permalink. I’d never heard of ‘science busking’ – I do admire you for doing such a thing. Takes some courage! Even if only one person is turned on to science by your efforts, I think you can count it a success. Thanks! I think the buskers must take the courage award – it does take guts to stop a stranger in the street. I didn’t need courage – it seemed like an easy task when first started talking about it. What I needed was persistence, to keep pushing to ensure we did get a result.